The best value rack on the market. Perfect for training studios, home gyms, die hards and amateurs. The Fitness Etc light commercial Power rack features a plethora of accessories to bring your home training to the next level. Dollar for dollar the most essential power ackack you can buy. The best value light commercial rack on the market. Perfect for training studios, home gyms, die hards and amateurs. The Fitness Etc. Light Commercial Power rack 3.0 is our newest model. 1. Laser cut pin holes: trying to line up your j-cups/spotter straps even can be a real pain. But with our laser numbered pin holes every 5 holes, it makes adjustments a lot easier. 2. Fat/skinny multi grip pull up bar: by having 1 half of the pull up bar extra fat and the other standard size, it creates an additional dynamic to your training without taking up additional space. A power rack, also known as a power cage, or squat rack, allows you to efficiently and safely perform a number of barbell exercises. 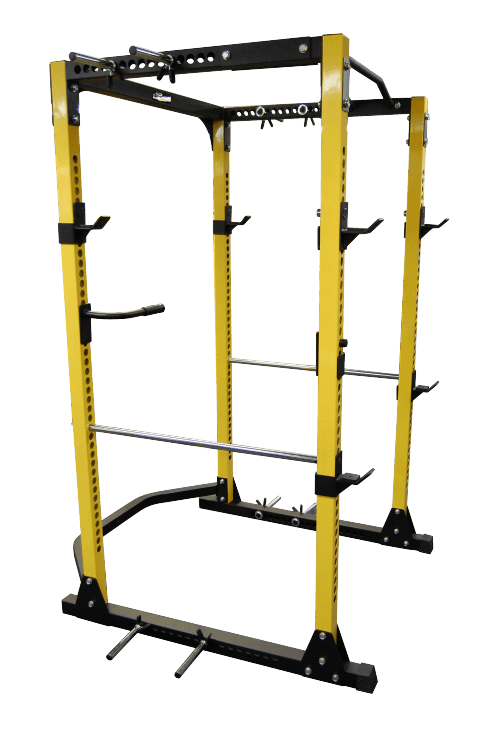 Our power racks have adjustable j-hooks that allow you to set the height of the bar, for example, setting them to a squat height or bench height, and safety catches that prevent the weight from going beyond a certain point. Here is a breakdown of the major benefits realized from using the light commercial power rack. 1. No Need for a Spotter If you train alone, it’s imperative that you do so safely. When exercising there should never be any hesitation in dumping a loaded bar. Your safety is the number one priority. The safety catches allow you to do this, saving your health, and preventing any serious damage to your floor. 2. Confidence booster Safety doesn’t just keep you from getting hurt; it creates the peace of mind that comes from that. That is, you can add that extra weight to the bar or attempt to push through one more rep because you don’t need to worry about getting pinned under the barbell. 3. Target a Specific Range of Motion Since you can adjust the safety bars to any height, power racks give you the ability to precisely train any part of your lift. For instance, if you want to work on the top part of your deadlift pull, you can set the straps to a specific height. 4. Wide Range of Exercises Bench, squat and chin ups are the main exercises you can do, and by adding the optional cable attachment you can do triceps press downs, lat pull downs, seated rows and more. 5. 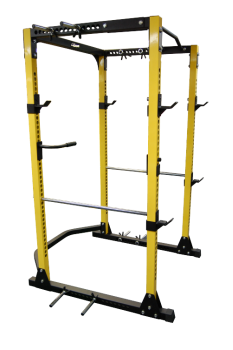 Training With Band Resistance With the Light Commercial Power Rack, you have the added benefit of adjustable band pegs on the top and bottom of the rack. This allows you to attach strength bands to your bar and create a variable plane of resistance to help bust through training plateaus. Features 8 fully adjustable Band Pegs on top and bottom. Laser cut numbered pin holes. Extra close safety holes for working on various sticking points on , benching and squatting with laser cut numbering. Solid Steel Multi-Grip fat/skinny Chin Up Bar with deep knurling.